We have helped nearly 100% of our high-achieving teen students get admitted to their share of Ivy League universities (Brown, Columbia, Cornell, Dartmouth, Harvard, Penn/Wharton, Princeton, and Yale), Stanford, MIT, UChicago, Duke, and ALL other top best-fit colleges. Our strategic and pragmatic expertise in the entire merit-based elite college admissions process has grown to match that of former deans of undergraduate admissions at Ivy League universities. Our older students and alumni enjoy learning and contributing at top colleges or graduate schools, thriving and making a difference in rewarding jobs at great companies, or building interesting tech startups (some already grown to an impressive stage). Success stories and testimonials abound! College is part of the journey but not the destination. Don’t just think college admissions. Think through college, career, and life. ThreeEQ’s unparalleled, integrated college admissions, life, leadership, and career success coaching and mentoring process not only helps our students achieve great life-stage outcomes (i.e. college admissions, internships, jobs, and careers), but also transforms them upward and unleashes their full potential as rising leaders and happy people. This helps our Family Clients gain powerful lifelong benefits (and avoid major opportunity losses down the line). Applying our deep professional experience, perspective, connectivity, and skill sets, our foremost Gen Z mentoring method is effective, inspiring, holistic, data-driven, and personalized at a quality level unmatched at even top private schools. 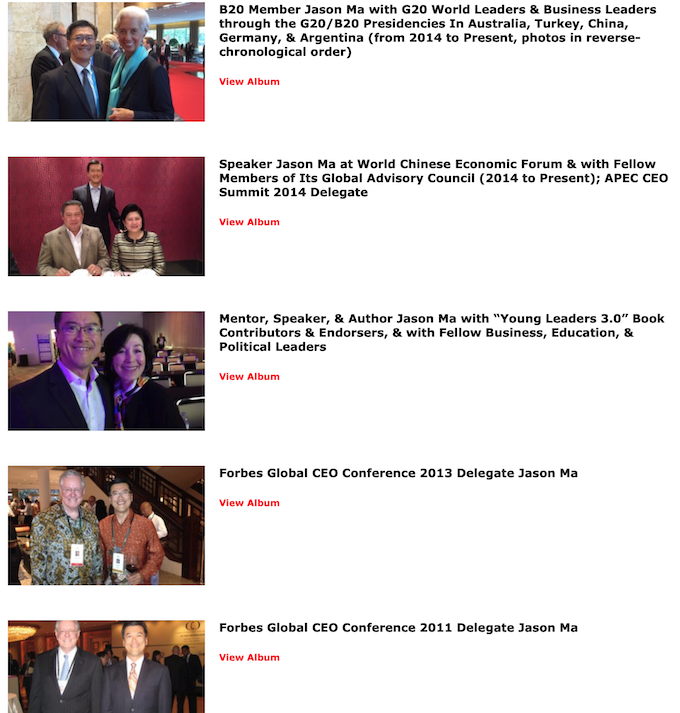 Take a look at our high-powered C-suite/Board advisory, global rainmaking, and mentorship capabilities, as well as event speaking and masterclass leadership here. 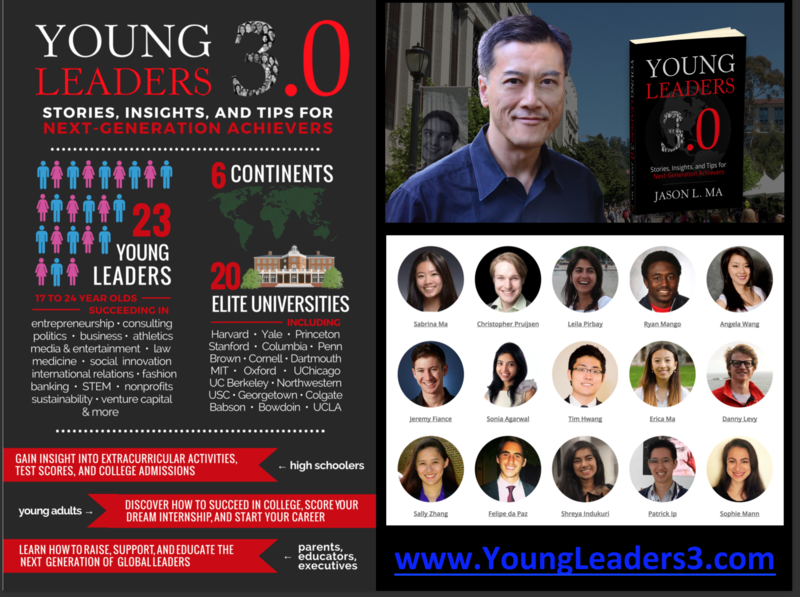 Sensing a higher purpose for the masses, Jason L. Ma authored Young Leaders 3.0: Stories, Insights, and Tips for Next-Generation Achievers, an acclaimed and inspiring book for teens, twentysomethings, parents, educators, and employers. This book features the authentic, personal stories of successes, failures, and lessons learned from a diverse group of 23 exemplary Gen Z and Millennial leaders and contributors—along with practical nuggets of wisdom, including overarching themes, success patterns seen, and concluding actionable advice from the author.